28% of Taca Airlines passengers were over 60. The most popular flight route for Taca Airlines was - Managua to Miami. The top travel destinations for Taca Airlines passengers were Managua, Miami, San Salvador. The most popular airport for Taca Airlines was Augusto C Sandino International Airport. Founded in 1931, Transportes Aereos del Continente Americano (or TACA) was the flag carrier of El Salvador. It was the second-oldest continuously operating airline brand in Central America and the Caribbean. It merged with Avianca on May 21, 2013 and is now known as Avianca El Salvador. It is one of the seven nationally branded airlines in the Avianca Holdings group of Latin American airlines. 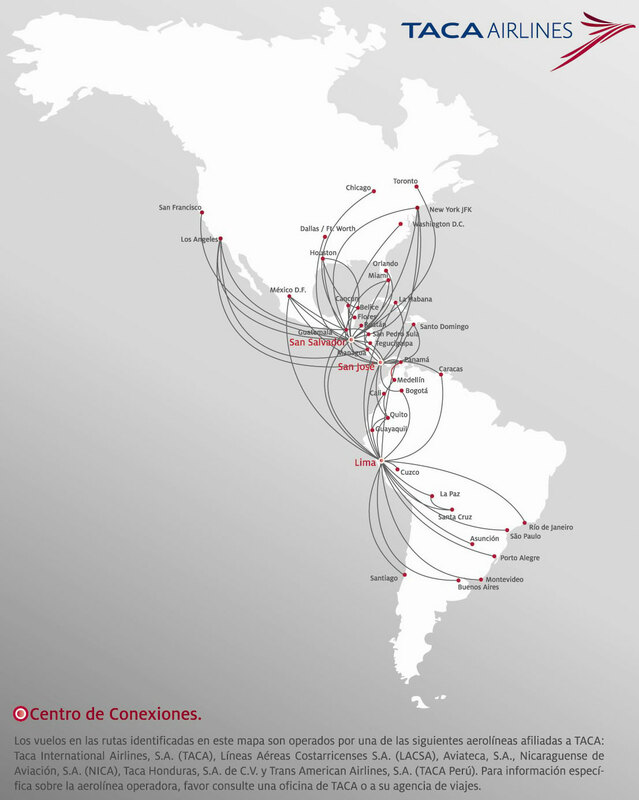 As Avianca El Salvador, it offers scheduled flights to North America, Central America, South America, the Caribbean, Europe and selected worldwide destinations from its hub at Monsenor Oscar Arnulfo Romero International Airport. It has a fleet of 41 aircraft that serves 28 destinations in 22 countries. Avainca El Salvador’s Frequent-flyer program is called LifeMiles. Avianca Ecuador follows the standard configuration of Economy and Business Class. For entertainment, Avianca El Salvador offers LCD screens with wireless controls, QWERTY keyboard and headphones with noise-cancellation capability. Avianca’s magazine, Avianca Entretenimiento offers information about the latest movie releases and programs that can be enjoyed during the flight. Travelers may also read the airline’s monthly publication called Avianca en Revisita for latest reports and news. Avianca El Salvador’s Business Class offers you preferential treatment and a host of exciting services that range from free boarding allowance and priority boarding to reclining seats and bonus miles. Business Class passengers are moved through a priority line during boarding and de-boarding. Also, the travelled distance is added to the accounts of LifeMiles members. The Business Class has reclining leather seats, extended lumbar support, a pillow, a blanket and more legroom. There is also one power outlet near every seat. Travelers can choose from over 400 songs and games, the latest movie releases, LCD screens with wireless controls as in-flight entertainment offerings. This is seconded by QWERTY keyboard and headphones with noise-cancellation feature. Travelers can access Sky Office System to work with their office-presentations and documents. Business Class passengers would get a free baggage allowance of 64 kg (2x32 kg) in international flight. If they’re flying to Columbia, Ecuador or Peru, they can check up to a total weight of 32 kg in maximum of two pieces of luggage. The travelers also get priority baggage unloading from the flight. The travelers are entitled to a wide range of delicious meals and beverages on all international flights. These offerings include main courses, desserts, coffees and soft drinks. Those traveling on special dietary restrictions or suffering from allergy would be offered suitable alternatives at no extra cost. Avianca El Salvador’s Web Check-in facility is available 24 hours before the scheduled flight departure. Taca Airlines Hub - Airports used as transfer points to get passengers to their intended destination.